2 minute recovery in between. Got in both 15 minute intervals. My splits for the intervals were 8:00, 7:45 for the first one and 7:49, 7:47 for the 2nd. Felt pretty good and happy with my paces. I went a different route on this one and on the way back I got lost for a few minutes because I missed my turn, but made it home safely. Tuesday: Plan- Rest Day, stretch and roll good. I had a good rest day – did some stretching and foam rolling. Wednesday: Plan-Comfortable 35-40 minutes with a few strides. I ran 4.11 miles with a couple of strides. Thursday: Plan-Rest day. Had my rest day. Friday: Plan-10-15 minutes with 2-3 strides in the am. I had a nice shake out run and ran 1.57 miles. Saturday: Plan-Race. Ran the Oregon Fall Half Marathon. This was a tougher race than I expected. I was so happy to PR!! Stay tuned for my recap. Sunday: Plan-Rest day, rest or go for walk. Took my rest day. Total miles = 25.01 miles. The week ended nicely with my half marathon PR on Saturday. I’m happy with the way things are going. Coach Dawn’s training has been great! I’m really loving the speed work stuff and advice she’s given me which I think definitely helped me get that PR for the half! 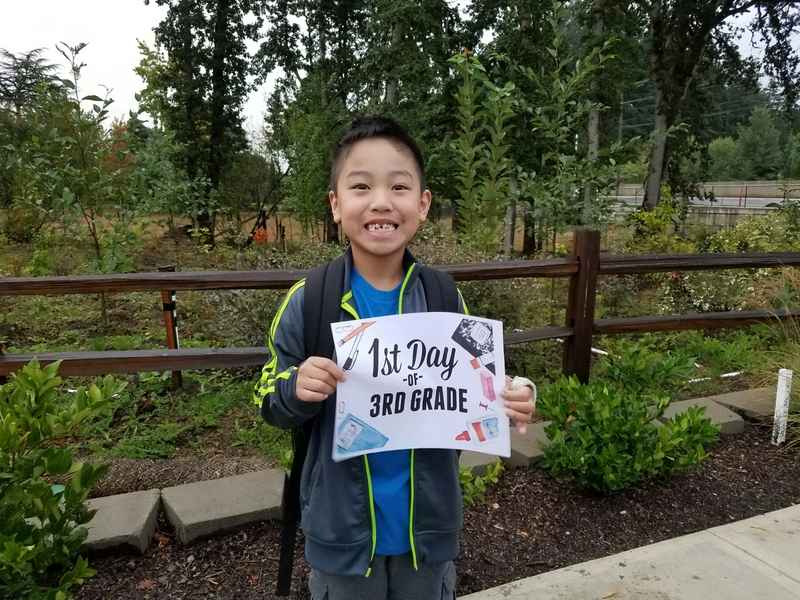 Other highlights of the week included back to school for my 8 year old on Tuesday. 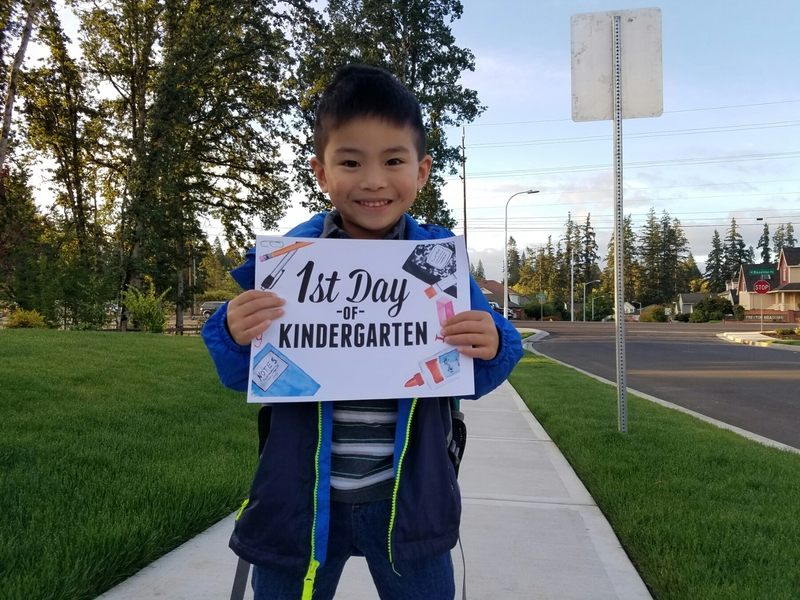 Thursday was the first day of school for my 5 year old. So nice that both the kiddos are in school full day. 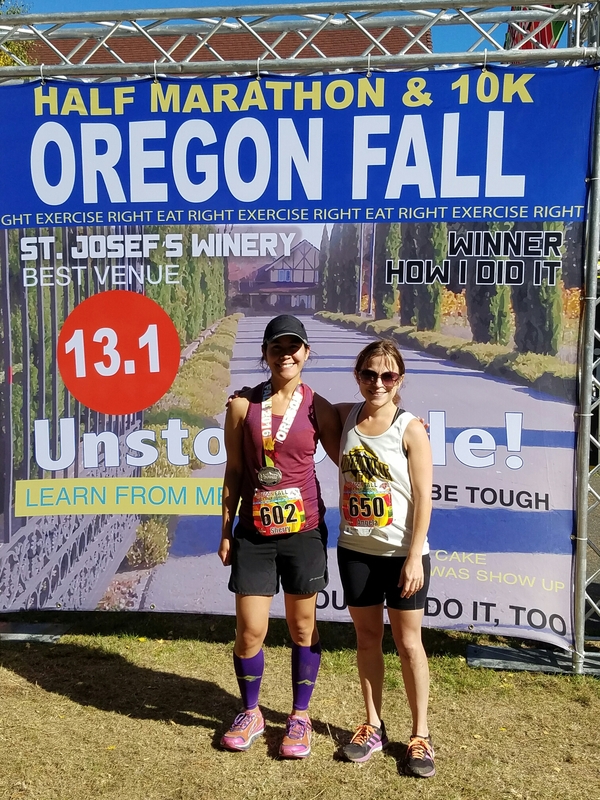 🙂 Running the Oregon Fall Half Marathon was the big highlight of the week. Here’s a pic taken after the race with Angela. So cool that we both got PRs! My post race meal after getting home and getting cleaned up, a guacamole cheeseburger and fries. 🙂 How’d your week go? Any races come up? What’s your favorite post race food? I love that finish line picture! How fun! I also really like your training–your coach is super creative and those long intervals will serve you well at the marathon. Congrats on your PR for the half marathon! Looks like training has been going really well! 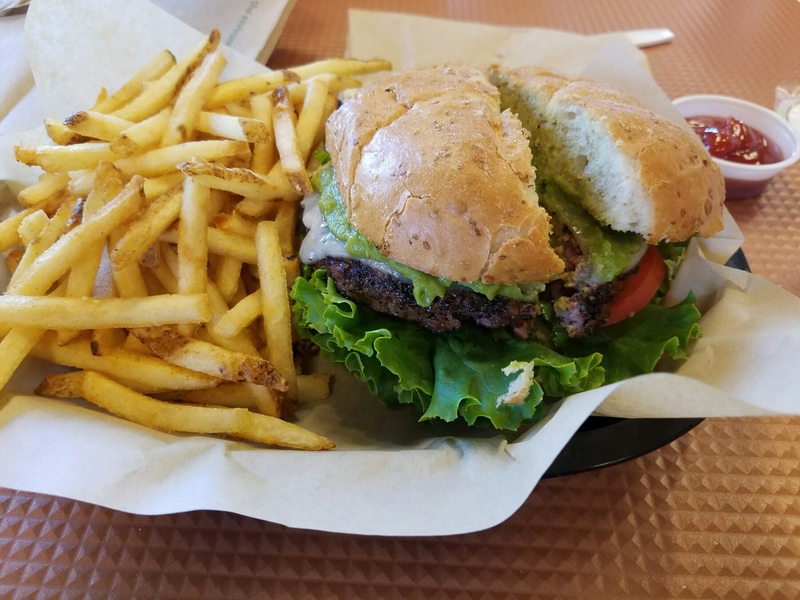 The burger and fries were well deserved and look delicious! I was thrilled to see you earned that new half PR! Congratulations. Your training has been so strong. It’s great you have a coach that you connect so well with. A cheeseburger is my favorite meal. It definitely hits the spot after a long race. The kids are growing up so fast. 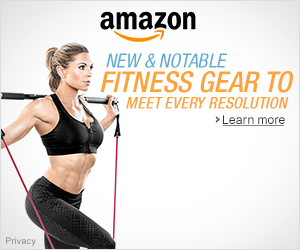 Thanks for linking, Sherry! Thanks Holly! Training is going well! 🙂 Cheeseburger is a great choice! Thanks for having the link up! What a great week for you Sherry! A half marathon as training for a full is really fun and inspiring. After my half in San Diego on August 21 I ate a lot of bread and seafood. I have to say bread is my favorite post race food! Your speedwork has definitely inspired me to add some intervals and strides to my training! PR on a tough course, that is super! I’d surely say your training under her is paying off well for you! Aww it is nice to have both kids in school huh. Pretzels and waffles are my favorite post race food, lol. That is after the banana at the race. Congrats on your PR! That is awesome!! I like that idea for a tempo run – 15 min intervals.